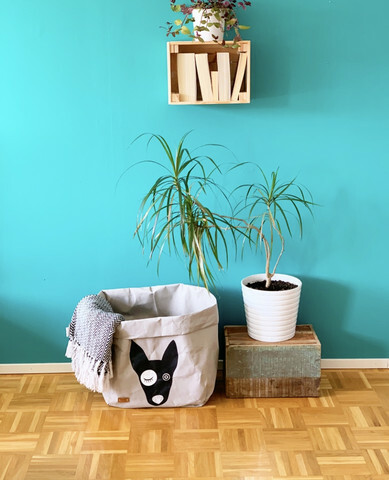 Lovely, cute dog <3 Storage basket for toys and goods, in the kids room. The product is made entirely of hand-washable paper. Each basket is unique and the craftsmanship is visible in the baskets. The material is so-called vegan leather paper, which is 60% plant-based cellulose and 40% natural rubber. The product is very resistant to wear and is lightweight. The material is resistant to water softening with warm water, and then easy to shape to the desired shape. After curing, it becomes hardened to cardboard. Suitable for use in wet conditions. The material softens in use and the more often it is washed. The material is felt and looking like paper. The basket is particularly suitable for toys with a small child because of its wide and shallow. The child can easily access the toys from the bag. Also popular as a dog toy bag or just for storage. Leather paper does not contain harmful substances (pentachlorophenol, PVC or BPA). May not be suitable for allergy to natural rubber. Ecological and ethical furnishings. The basket is not only practical but also ideal for interior decoration.